The official website of the Tibetan Government-in-Exile, which administers all matters pertaining to Tibetans in exile, including the re-establishment, preservation and development of Tibetan religion, culture and education. 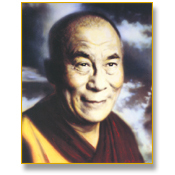 Teachings by His Holiness The Dalai Lama on "The Heart Sutra"
California in May 2001, provided by LamRim.com Tibetan Buddhist Internet Radio. Dedicated to the preservation of the Tibetan Buddhist religion and culture, Snow Lion Publications is the authoritative press in the West for Tibetan Buddhist Dharma Scriptures, as well as for other Dharmaware. Their quarterly newsletter is filled with Dharma news and a catalogue of the many items they offer for sale. "The Snow Lion" is available to be delivered as well as being online. The Canada Tibet Comittee (CTC) is a registered, non-profit organization with branches in several cities in Canada. 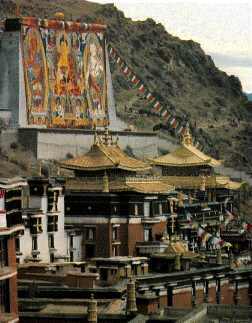 CTC was formed in 1987 in response to growing unrest inside occupied-Tibet. Its goal is to create a structure within which concerned Canadians can work together with their Tibetan friends to develop increased Tibet-awareness in Canada. The Canada Tibet Comittee (CTC) Toronto Chapter's new site. Keep posted about upcoming events, such as rallies and letter/signature campaigns. Also, see news and pictures from past events. TibetLink is about the aspirations of the Tibetans Worldwide. We have grown to become the Internet's largest and most active Tibetan online community providing chats, message forums, news, music, links, directories, search engines, calendar of events, and lots of other interactive features. We serve Tibetans around the world and are based in Toronto, Canada. Our goal is to provide a virtual space on the internet for Tibetans to freely communicate and exchange ideas thus "Linking Tibetans Worldwide". This is the home site of Thubten Jigme Norbu, Takster Rinpoche, the elder brother of His Holiness The Dalai Lama. Jampa Ling Belfast is a residential centre in Ireland under the patronage of His Holiness The Dalai Lama and whose Spiritual Director and Resident Teacher is Ven. Lama Panchen Otrul Rinpoche. Foundation for the Preservation of the Mahayana Tradition: Worldwide organization of Dharma Centers established under Lama Yeshe and Lama Zopa. The Tibet Online Resource Gathering is operated by the International Tibet Support Group community, providing information on the plight of Tibet and serving as a virtual community space for the movement. This site contains a wealth of important links. The International Campaign for Tibet is with great effort and effectiveness working for the freedom of Tibet. The Milarepa Fund actively supports the Tibetan struggle by educating the youth of the world, who represent a powerful vehicle to lend support to the cause of Tibet. Includes Universal Declaration of Human Rights.